It was a cold morning in early March here in the mountains of Western North Carolina. I was on my way to work from our rural mountain home where we raise sheep, mini donkeys, pigmy goats and a few exotic cats. I’m a realtor so as usual along the way I give a casual glance to properties I have sold to sort of look after the places in the owner’s absence. That morning not a half mile from my home as I looked up the drive to the vacant camper my client used in the summer I noted that someone had thrown out a dirty yellow comforter at the bottom of the drive. I looked a little closer and saw it move. My first though was that someone had dumped a litter of pups, which frankly is not all that uncommon in this rural area where older people can remember how hard it is to feed children, let alone dogs. I stopped to see what was there. It was very cold by southern standards about 23 degrees and I had visions of half frozen puppies left to die, but as I approached the now active blanket I discovered an even more disturbing creature. Covered from top to bottom in mange and with almost no fur, the ugliest smelly dog you have ever seen, crawled out. She looked up at me with one blue eye and one brown eye as if to say please help me. As she emerged from her yellow blanket it was clear that she had suffered for a long time. She was black and white (I guess you’d call it blue) Australian Sheppard. She was so thin and having almost no hair, you could see even the structure of the vertebrae in her old tired back. She whined and I knew I must do something to help. I had been to the grocery the day before and had not yet unloaded the 50 lb bag of dog food from the rear of my car so I opened it and gave her several large handfuls. She immediately began to eat so I covered her in her stinking blanket and told her I’d be right back. I quickly returned home, picked up a crate and returned to the poor creature. By the time I returned she had finished her breakfast and appeared to be contentedly waiting for me to come for her. Now I had a big problem. What was I going to do with a dog that was in such horrible condition? I couldn’t bring her home since I lacked facilities to isolate her from my other dogs and she would surely give them all mange and God knows what else. I couldn’t take her to the Humane Society since they where in the middle of a crisis from not properly isolating new arrivals, so every sick dog coming in was creating a new epidemic. I had just rescued a Border Collie from them that had such severe Kennel Cough I thought he might not survive. Institutionalized animal care is not always all it’s cracked up to be. The reports in the local paper recounted over and over again stories about puppies and dogs that had become sick after arriving at the shelter. I certainly did not want to contribute to the Society’s problems by presenting them with a dog that was the equivalent of “Typhoid Mary”. So I decided on door number 3. I scooped her up and took her directly to the vet. I knew I could not take her home to sicken my dogs and that if I took her to the Humane Society I would doom innumerable other dogs so I decided the most humane thing to due was to deliver her to the vet and have her euthanized. Now this seems unkind but compared to letting this dog slowly freeze and starve to death on the side of the road or let her infect 50 other dogs that would be euthanized, it was my only option. Upon arriving at the vet’s office I was greeted with horrible stares of disgust. I explained that I was not responsible for this animals poor condition but only the recipient of someone else inhumanity. We were seen quickly even without an appointment (probably that “Typhoid Mary” thing). At first glance the vet said that under the circumstances, who ever dumped her on the side of the road would have been kinder to put a bullet in her. I personally felt like I would like to put a bullet in the person who left her. The Doctor looked her over and offered her a biscuit, which she readily accepted. He said that she did not appear to be ancient although her teeth were ground smooth in front and her canines where just pegs with little or no enamel left. Since she was still willing to eat he said she might be salvageable if I was willing to take her on. I looked at that stinky bag of hairless bones and she looked back at me with a pleaful expression (be it a little odd with her one blue eye) and I agreed to try. They did a skin scrapping and determined that her mange was curable. They could not get a stool sample since she obviously had not eaten in quite some time. She was negative for heartworms (at least one blessing). They cleaned her ears, which were thick with discharge from an untreated Yeast infection. Her skin beyond just mange was elephant like. It was the result of a yeast infection gone untreated for ages. And least of all, was her weight of only 15lbs on a dog that should have weighed 40lbs. In order to prevent her bringing all her problems home to my animals we decided to hospitalize her for 5 days during which time she could have several dips for mange, be treated for internal parasites and get her various other infections under control. I brought her home, at the end of her 5-day stay with the vet, where she seemed quite content to bask on the front porch and eat regularly. She settled in with our other animals and over time began to re-grow some hair and gain weight. Her hair growth was limited since some of her skin seemed devoid of any remaining hair follicles. She suffered from terrible allergies which caused her to self mutilate by scratching or chewing. We got this under control by placing her on a maintenance dose of steroids and an anti-fungal for her now chronic skin infection. The vet expected her to live no more than a year or two but if she could have a good quality of life it might make up for the horrible treatment she had received prior to her abandonment. She loved to play fetch and was very smart and responsive to command. Obviously someone had spent some time with her in her younger years and cared for her. How she came to be dumped by the side of the road I will never know but I do know that if there is a God in Heaven the person who so cruelly allowed her to get so sick and thin and then dumped her to die will see justice someday. The point to all this is that it never ceases to amaze me how cruelly we humans can be to the creatures we supposedly care about. Someone decided one day they didn’t want this dog anymore so they dumped her. Our society has become so callous that we think everything is disposable. I guess that’s why we hear so many horror stories about child and elderly abuse. Like this poor dog someone decides that they don’t want to be responsible for their child or elderly parent so they neglect or abandon them. I believe if more people were taught from early childhood that we should respect and care for animals then they would be better able to respect and care for other people. We need to teach our children that no living thing is disposable!! Our small farm offers a haven for several animals they we never intended to care for but had dumped on us by uncaring people. We are animal lovers, Exotic or Domestic, makes no difference to us. Because we keep exotics we are better able to care for all the others. I challenge anyone to say we should not care for each and every one of our charges regardless of where he or she came from or whether he or she are domestic or exotic. Everyone and everything needs someone to care about them at some point in their lives. Now named Zoey, the ugliest dog in the world, she has lived on my front porch for 3 years. She has a slow growing malignancy, which will take her one-day, bad knees and elbows and a very limited hair coat, which we supplement with a nice sweater, which she loves to wear. She takes enough medication to start a medical clinic and is a little over weight (to put it mildly) She is a VERY HAPPY DOG. She runs the fence and barks at the sheep, nips a goat every now and again just because she can. 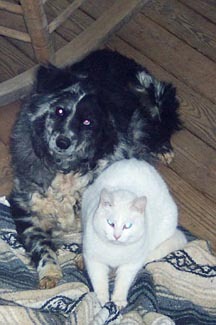 She is a friend to the barn cats, a companion to the Border Collie and guards the cattery like a champ. She brings joy to our lives knowing that she is HAPPY and we love her.